The most detailed images yet of strange "white spots" on the dwarf planet Ceres beamed down from NASA's Dawn spacecraft recently, bringing us closer to solving the puzzling mystery that emerged upon Dawn's arrival there last March. Ceres is the largest object in the Main Asteroid Belt that rings the sun between the orbits of Mars and Jupiter. Discovered by chance in 1801, Ceres was the first asteroid ever detected, and it's still the largest object in the Belt. 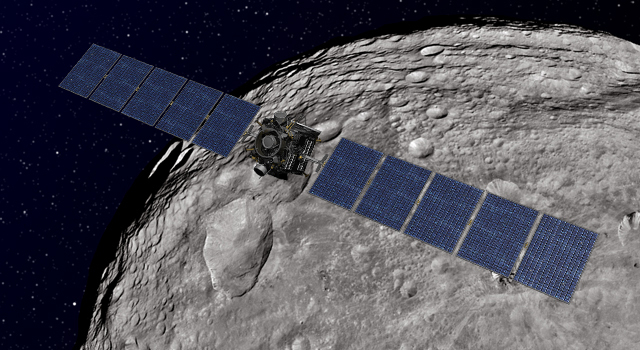 As the Dawn mission continues to collect and transmit ever more detailed information about Ceres, we expect to learn something about the early formation of the solar system. Ceres was classified as a dwarf planet in 2006, along with Pluto and three other solar system objects. 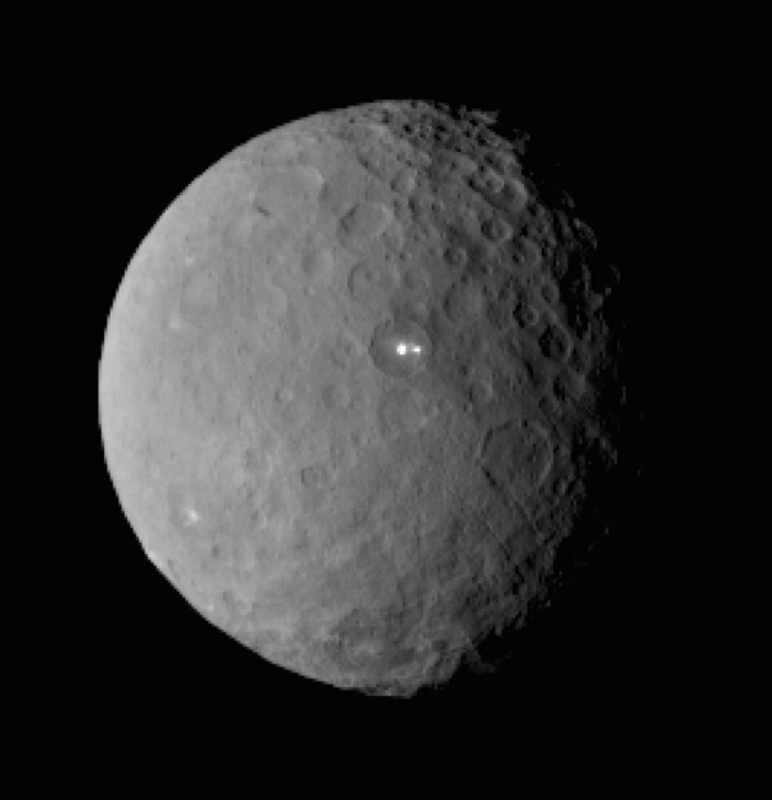 But it wasn't until Dawn's arrival that we knew what Ceres looked like. And in keeping with what has become the rule, not the exception, in solar system exploration, Ceres had some surprises for us in the form of big, gleaming white spots. When Dawn first drew close enough to Ceres to capture these brilliant but indistinct blurs on camera, scientists weren't sure they meant anything actually existed; maybe they were simply an effect of exaggerated contrast in the low-resolution images. But as Dawn settled into orbit around its new home, and in the months since, it has captured far more detailed images that show the white spots are, in fact, actual physical features. 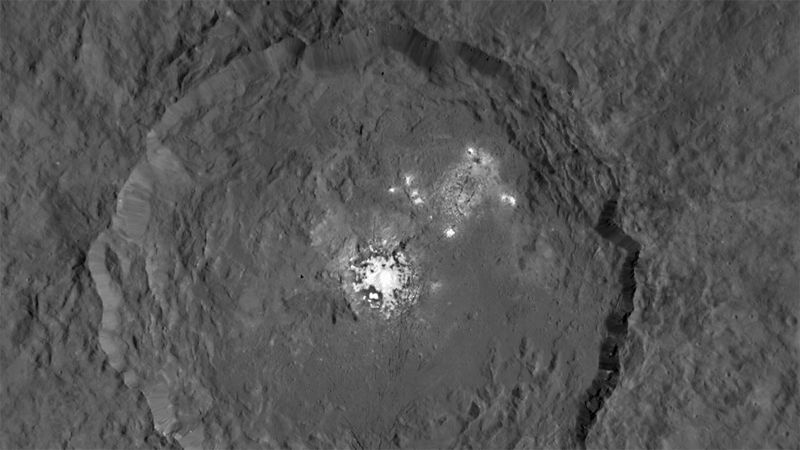 And while the spots have been seen in several locations on Ceres, the brightest of them is in a crater named Occator. This brilliant dot sits dead center in Occator Crater, with a more diffuse scattering of smaller spots located halfway between the crater's center and rim. The close-up picture at the top of this post is a composite of two images, each of which has been adjusted for brightness to yield good exposures for both the bright spots and the surrounding, darker crater surfaces. The balanced exposure reveals intricate complexes of bright, shiny surface regions, set in the topography of the crater's terrain. The first thought that comes to my mind when looking at these pictures is: Are we looking at some form of ice? 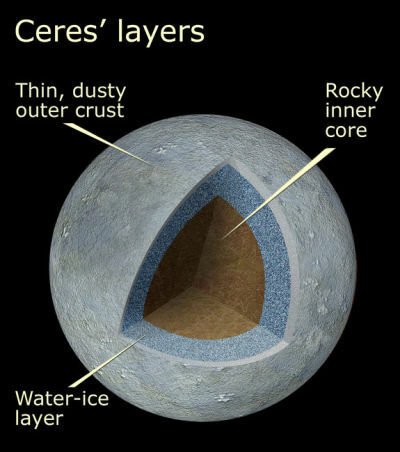 Astronomers have known for a while that Ceres possesses water in some form. The European Herschel Space Observatory detected plumes of water vapor outgassing from two dark regions on Ceres, even before Dawn arrived there. If we know water vapor is spewing out of Ceres, might we also imagine snows of water ice falling back onto the surface, like a snowy version of volcanic ash? Or perhaps some kind of surface eruptions that leave behind crusty mineral deposits, like the geysers or hot springs of Yellowstone National Park? We might imagine things like that—and what a mesmerizing notion: extraterrestrial snow volcanoes or cold hot-tubs! Do we know what these spots are yet? Not quite, but the truly exciting thing is that with Dawn's ongoing investigation, we are perhaps on the verge of knowing what's going on in Occator Crater. Dawn recently commenced a third global survey of Ceres, gathering data of its entire surface from continually changing angles, to produce a 3-D topographical map of the dwarf planet. Dawn is also collecting data on surface chemical composition -- in particular for the yet mysterious white spots.